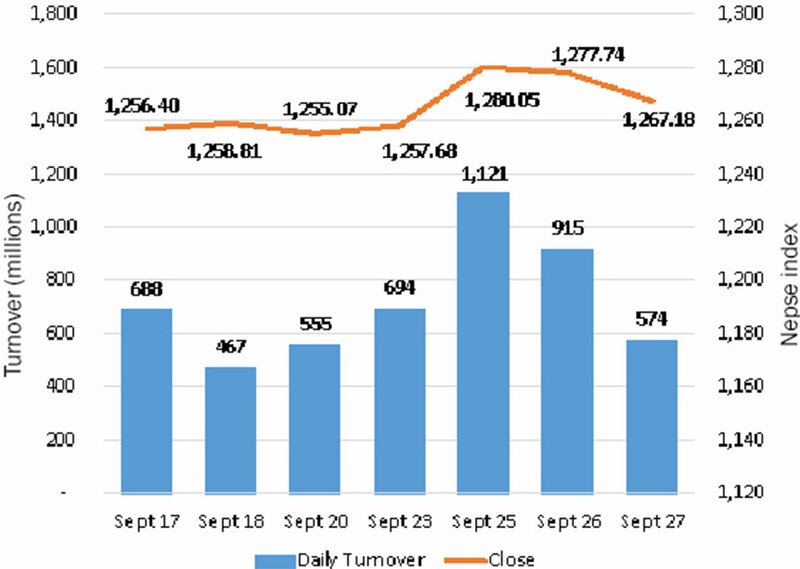 KATHMANDU, Sept 28: The benchmark Nepal Stock Exchange (Nepse) index fell sharply at the beginning of the Thursday’s trading session, shedding almost 6 points. The bourse recouped its losses within the first trading hour with the index trading slightly higher at mid-day. Nonetheless, stocks came under pressure throughout the latter trading hours to close 10.56 points, or 0.83 points, lower at 1,267.18 points. 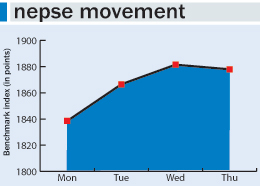 Nepse index extended its losses for the second consecutive day as traders continued to book profit. The fall in Nepse index was also accompanied by a decline in market activity. 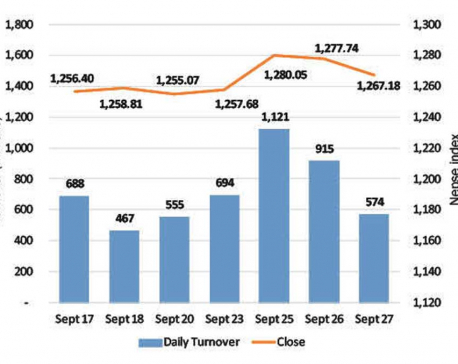 The exchange registered a total turnover of over Rs 573 million on Thursday, down 37.26 percent compared to the session earlier. Despite the decline witnessed on the day, Nepse still trades around the support zone of 1,170 points, suggesting that the market has not experienced a sell-off yet. Most of the sectors closed lower, reflecting the weakness in the broader market. Only Manufacturing & Processing, and Hotels sub-indices ended the day higher. Hydropower stocks were the major drag of the day, with the group’s sub-indices shedding 1.51 percent. Besides, Non-life Insurance and Banking stocks also struggled as they saw their sub-indices go down by 1 percent each. Meanwhile, Microfinance and Life Insurance sub-indices posted loss of 0.61 percent and 0.51 percent, respectively. Shares of Prabhu Bank Ltd led the list of companies in terms of trading volume with a total turnover of Rs 47 million on Thursday. More than Rs 40 million worth of shares of Surya Life Insurance Co Ltd Promoter Shares were also traded on the day. Next, Nepal Bank Ltd registered a total turnover of over Rs 27 million. NMB Bank Ltd, NIC Asia Bank Ltd and National Hydropower Power Company Ltd followed suit with total turnover of over Rs 21 million each. National Hydropower Company Ltd was the biggest gainer of the day, as its price rallied by almost 10 percent. Second on the list of gainers was Bottlers Nepal (Terai) Ltd which saw its share price go up by over 4 percent. Microfinance stocks, including Nadep Laghubitta Bittiya Sanstha Ltd and Civil Laghubitta Bittiya Sanstha Ltd, rose over 3 percent each. Ngadi Group Power Ltd and Hathway Finance Company Ltd were the other major advances of the day. On the contrary, energy stocks, including shares of Himal Power Partner Ltd and Arun Kabeli Power Ltd, sank over 5 percent each. Nepal Community Development Bank’s scrip fell 3.84 percent, while United Finance Ltd closed 3.79 percent lower. Other losing scrips include Machhapuchchhre Bank Ltd, Sindhu Bikas Bank Ltd and Siddhartha Insurance Ltd.
On earnings front, Panchakanya Mai Hydropower Ltd published its financial report for the fourth quarter of Fiscal Year 2017/18, reporting a net profit of over Rs 72 million, up from Rs 16 million in the previous year. The company, whose shares are yet to be listed on the exchange, had floated its Initial Public Offering (IPO) shares earlier in mid-July. ARKS technical analysis indicates the market extending its correction for the second straight day. Consequently, the index closed just below the support of 1,170 points. Nonetheless, with Moving Average Convergence/Divergence (MACD) trending in the positive territory, the market sentiment still seems to favor the bulls at present. In the meantime, the immediate support lies at 1,150 points.